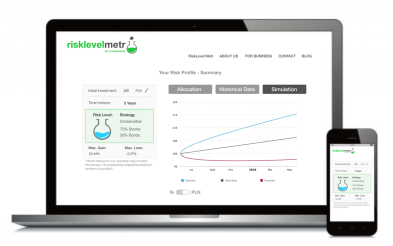 RiskLevel Metr, created by Capital Lab, allows you to meet the needs of your clients and their personal situation through a suggested investment portfolio, which at the same time abides by their risk tolerance level. RiskLevel Metr shows the kind of financial instruments a client should have in their portfolio, and in what proportions they should hold these instruments. Our calculations show that our suggested portfolios are able to satisfy client financial needs at 95% confidence levels. The majority of people make investments unfitting to their own level of risk. Educate them about such mistakes and encourage positive changes to gain their trust, and ultimately broaden your client base. A properly chosen strategy is the basis of any effective investment. Not everyone has the predisposition nor the capacity to carry a high degree of risk. That is why it is important that the level of risk acceptable by a client is adjustable to his or her preferences and abilities, and not vice versa. Our RiskLevel Metr leads the client through a series of questions, which helps you to identify their acceptable level of risk. The client cannot only look, but is likewise aware of the risk connected with his or her investment portfolio, in the long-term contributing to a body of faithful and content clientele. RiskLevel Metr is in accordance with the necessary regulations of the MIFID, which requires advisors to introduce clients to the risks related to investments. When choosing investment solutions, we often steer in the direction of advertisements and the opinions of those closest to us, as opposed to the level of risk for a given financial instrument. Indeed, the majority of people invest in solutions for which the level of risk necessarily deviates from their risk level of risk tolerance. We put our money in low-risk products, despite the fact that we have a predisposition to invest less conservatively. By the same token, we invest in products loaded with high risk and we retreat from the first faint fall on the stock market. RiskLevel Metr shows and explains how and why your clients should stick to their strategy. 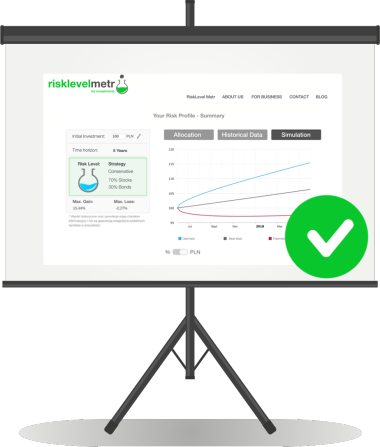 RiskLevel Metr shows and explains how and why your clients should stick to their strategy. 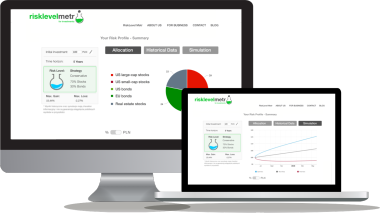 Ryzykometr does not only diagnose the level of risk for a client, but it also introduces an investment strategy applicable to his or her needs. The proportions of specific instruments have been chosen in such a way that reflect the level of risk tolerance for a client, while at the same time maximising his or her returns. The selection of instruments for every investment strategy is automated, and the result presented is in this way easily accessible to the client. Every strategy has been founded on historical data as well as a simulated prognosis, which will allow you to better focus on your core business, building relationships. Ryzykometr is also easily adjustable to the needs of your business. Let us know – we’ll create strategies based on products available in your offer!